KANNAPOLIS, N.C. — Brent Offenberger was driving along Loop Road in 2006 when he stopped by the Hardee’s and watched the implosion of the old Pillowtex/Cannon Mills towel distribution center and bleachery building. Offenberger has been a woodworker since his father got him interested in the hobby when he was 11. So w hen Cannon Mills came down, he wanted to nab some of the old wood before it got hauled away. Offenberger pulled into the demolition site, talked to a worker and was soon left the site with three huge beams and eight planks. Some as old as 100 years — and transformed them into wooden toys that are nothing short of artwork. He also collected scraps from the construction of the North Carolina Research Campus, where he works as a maintenance technician. 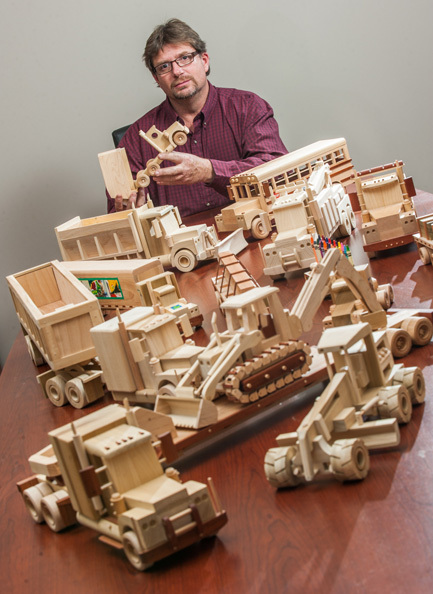 The toys that Offenberger makes can take as little as three hours for a simple piece, but more complex pieces take a bit longer. Just one piece took him about 100 hours to make. It was a truck and trailer with a track hoe with working treads and scoop, all made of wood from Cannon Mills and the North Carolina Research Campus. Offenberger made the toy for Ryan Dayvault, whose family sold the Cannons the property where Cannon Mills was originally built. Dayvault is also employed at the North Carolina Research Campus, which was built on the old Cannon Mills property. Dayvault often shows off the toy truck and track hoe to visitors to the Research Campus. “It was really special, especially because of having the Cannon Mills and the current Kannapolis, the past and the present, all together,” Dayvault said. For Dayvault and others who appreciate Offenberger’s work with the Cannon Mills wood, it’s a way to remember the past. Offenberger said he often gets a similar response when people see his toys and realize they are made out of Cannon Mills wood. Offenberger himself has no ties to Cannon Mills, but he remembers his sister living in Kannapolis and how busy the plant would be when he drove by. Originally from Ohio, he moved to North Carolina in 1984 to find more work since jobs were scarce in Ohio at the time, and remembers seeing the traffic at Cannon Mills. “I said, ‘They’ve got more people employed in that one building than my whole hometown in Ohio did,’” Offenberger said. Since collecting the wood from Cannon Mills, Offenberger has heard more and more stories about the old plant. He now wishes he had gotten more details about exactly where the wood came from when it was taken out of the mill.